Winter in my hometown of Boise, Idaho can get pretty chilly. We typically don’t get a whole lot of snow in the city, but being near mountains, we do get those piercing cold winds that seem to go right through to your bones despite multiple clothing layers throughout the season. I don’t like going outside much when it’s so cold, and I don’t get the exercise I need … and neither does my boy, Baymax. Moooom. I need more blankets. 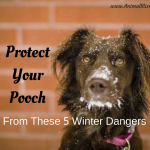 Staying inside and sedentary is a habit of many people during the winter — and even outside of the cold season — and our lack of exercise often hurts more than just us; it hurts our dogs too. Lack of exercise and a bad diet can lead to our pets gaining weight. 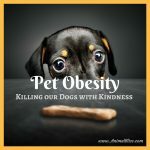 Pet obesity has becomeng a real problem, and our bad habits are causing this. We control what and how much our pets eat and how much exercise they get, and when they become obese, we have no one to blame but ourselves. 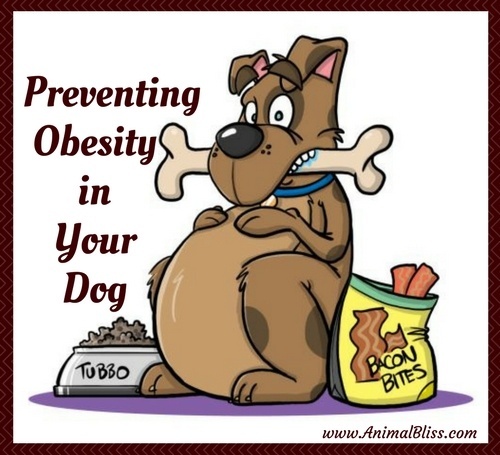 Preventing obesity in your dog is your responsibility. Is My Dog Too Heavy? 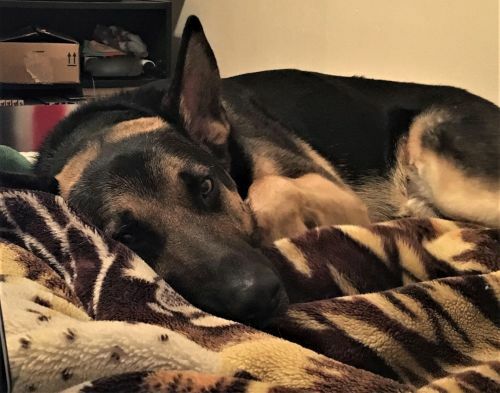 The ideal weight for dogs varies significantly from breed to breed — and sometimes even within the breed (German Shepherd Dogs can average anywhere from 50 to 100 pounds!) 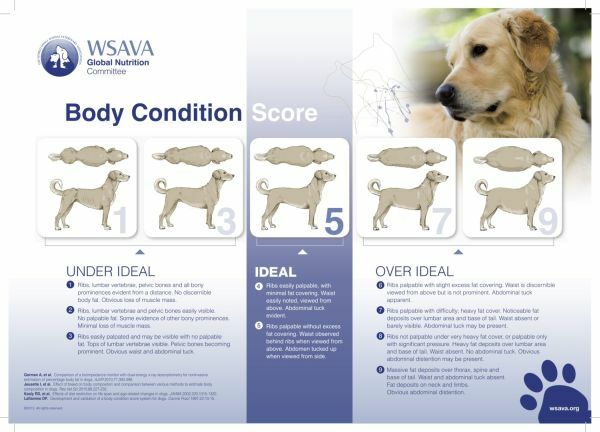 — so it’s better to use your dog’s own body to gauge if their weight is healthy, rather than their breed standard. 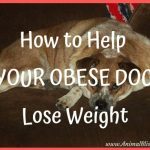 You can probably tell right away if your dog is severely overweight, but if you are wondering if their weight is headed in the wrong direction, you can best tell by taking a good look at their midsection. 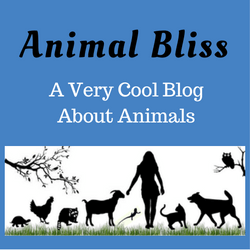 You should be able to feel your dog’s ribs and (if their hair is short enough) see the last two ribs when looking at them from the side, as well as see a visible difference between their chest and their midsection. When looking from above, you should be able to see a slight waist between their ribs and their hips. If, by following this chart, you notice your dog is overweight, now is the time to start taking action to prevent their weight from getting worse and get your furry friend back into shape. 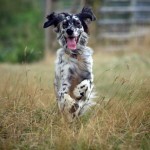 Every dog has varying energy needs, but even the calmest of dogs require regular exercise. A lack of activity can have the same effects on our dogs as it does on us, such as weight gain, weak bones and muscles, and a higher risk of developing chronic issues such as diabetes and arthritis, so making sure they are getting exercise on a regular basis is vitally important. 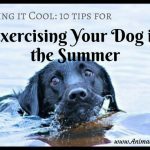 Luckily, incorporating more exercise into your dog’s life will have the added benefit of adding more to yours! Getting regular exercise has so many benefits for you and your dog’s health, so you can both get healthier together by making time for added activity such as a daily walk around the neighborhood. If you already do that, but your dog is still quite hefty, start making the walks a little longer and a little faster-paced. If your dog is young enough, try slowly working up to running. If the thought of a daily run is enough to send you to the hills, then use that opportunity to go hiking instead! 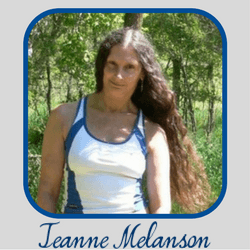 The sloped and rough paths of hiking trails will get your heart moving and your muscles working just as well, and it tends to be a little more fun, for some, than just running. While exercise is essential for maintaining your dog’s weight, even more important might be their diet. A balanced diet is key to keeping a healthy weight. Many overweight dogs’ food problems can be traced back to too much human food — how can you say “no” to giving your dog some of your food when they are begging with that adorable face of theirs. Most human food is incredibly bad for them, especially if they are receiving it on a fairly regular basis. If you are feeding your dog table scraps, stop now; that’s the first step you can take in preventing obesity in your dog. Improving their diet will help improve and maintain their ideal weight. Another food issue that causes many dogs to gain weight is over-feeding, which tends to happen unintentionally as pet parents try to follow the portion guidelines they’ve read about or see on their dog’s food bag. But much like humans, every dog metabolizes food differently, so they require different amounts. If your dog is reasonably inactive or has a low metabolism, they aren’t going to need as much food as a dog their same size which is super active or has a naturally high metabolism. 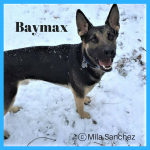 My dog, Baymax, is an example of a dog who doesn’t get as much exercise as is typical for his breed, but he has a super high metabolism, so I have to feed him more than what his food bag suggests for him to maintain a healthy weight. 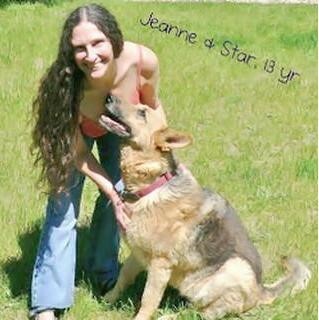 My previous dog was reasonably active, but as she got older her metabolism slowed significantly, and we had to monitor her portions more carefully to keep her at a good weight. While following the portion guidelines suggested is advised when first starting a new food, always watch your dog’s weight over time and adjust their food amount as needed. And, of course, consult with your veterinarian when it comes to feeding and maintaining your individual dog’s weight. Letting your dog become severely overweight is harmful to their health and overall well-being, and is sure to take years off their life. Our dogs’ lives are already much shorter than we would like, so preventing obesity in your dog by keeping them in tip-top shape with regular exercise and a proper diet is vital to making sure they are happy and healthy for long life. Be sure to consult with your vet about any diet and exercise changes you would like to make for your pet as well as getting weight loss advice tailored to your dog. Cloudy Eyes in Dogs: Is it Cataracts or Something Else?